Leader: Chaste Lover of Mary, how overwhelmed you were when you thought that you would have to end your betrothal to her. But when the angel of God came to you in a dream, you were filled with awe to realize that Mary would be your wife, and you would be the guardian of the Messiah. All: Help us St. Joseph, help our families and all our loved ones to overcome all sadness of heart and develop an absolute trust in God’s goodness. Leader: Faithful guardian of Jesus, what a failure you thought you were when you could only provide a stable for the birth of the Holy Child. And then what a wonder it was when shepherds came to tell of angel choirs, and wise men came to adore the King of Kings. All: Through your example and prayers, help us St. Joseph and all we love to become like sinless mangers where the Savior of the world may be received with absolute love and respect. Leader: Tender-hearted Joseph, you too felt pain when the blood of Jesus was first shed at His circumcision. Yet how proud you were to be the one privileged to give the name Jesus, Savior, to the very Son of God. All: Pray for us St. Joseph, that the sacred blood of Christ, poured out for our salvation, may guard our families, so the Divine Name of Jesus may be written in our hearts forever. All: Help us, St. Joseph, to see with eyes of faith that even the sorrows and pains of those we deeply love can become the pathway to salvation and eternal life. All: Teach us by your example, St. Joseph, to keep far from the false idols of earthly attractions, so that like you, we may be entirely devoted to the service of Jesus and Mary. Leader: Ever-obedient Joseph, you trustingly returned to Nazareth at God’s command, in spite of your fear that King Herod’s son might still be a threat to Jesus’ life. Then what fatherly pride you had in seeing Jesus grow in wisdom and grace before God and men under your care. All: Show us St. Joseph, how to be free from all useless fear and worry, so we may enjoy the peace of a tranquil conscience, living safely with Jesus and Mary in our hearts. 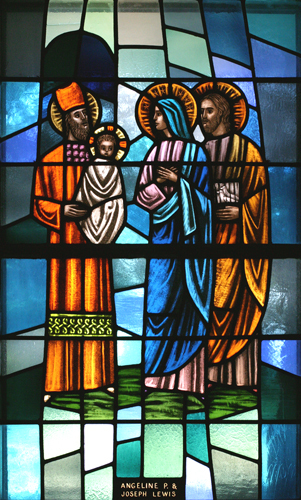 Leader: Dependable father and husband, how frantic you and Mary were when, through no fault of yours, you searched for three days to find Jesus. What incredible relief was yours when you found Him safe in the Temple of God. All: Help us St. Joseph, never to lose Jesus through the fault of our own sins. But if we should lose Him, lead us back with unwearied sorrow, until we find Him again; so that we, like you, may finally pass from this life, dying safely in the arms of Jesus and Mary. Leader: And Jesus Himself, when he began His work, was about thirty years old being, as was supposed, the son of Joseph. Leader: Pray for us, holy Joseph. All: O blessed St. Joseph, tenderhearted father, faithful guardian of Jesus, chaste spouse of the Mother of God, I pray and beseech you to offer to God the Father my praise to Him through his divine Son, who died on the cross and rose again to give us sinners new life. Through the holy name of Jesus, pray with us that we may obtain from the eternal Father, the favor we ask . . . (Pause) . . . We have been unfaithful to the unfailing love of God the Father; beg of Jesus mercy for us. Amid the splendors of God’s loving presence, do not forget the sorrows of those who suffer, those who pray, those who weep. By your prayers and those of your most holy spouse, our Blessed Lady, may the love of Jesus answer our call of confident hope. Amen.